The high-speed cartoning machine is used as the packaging equipment for drugs and other pharmaceutical products. It carries out a variety of functions, including specification folding, paper box opening, goods packing, printing batch number and box sealing. This packaging equipment uses PLC control in order to monitor the operation of each process, and will automatically remove unqualified products during operation. If any issues arise, this carton packaging machine will automatically shut down, making debugging easy to immediately carry out. 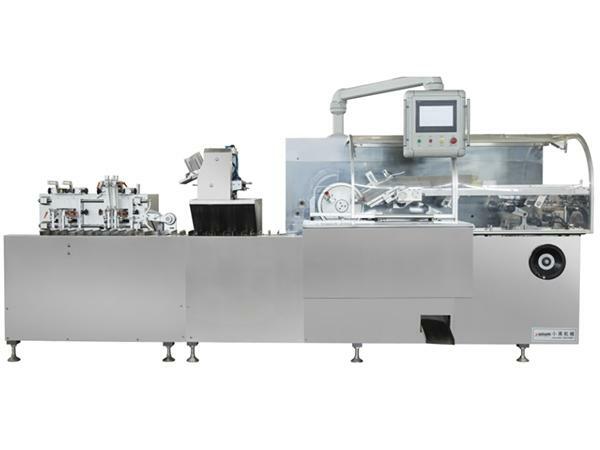 This equipment can be used as a standalone machine, or connected to a full packaging line, including blister packaging machines or a hot melt coating machine. 2. The limit deviation of the paper thickness is ±5m. 4. Indentation line depth is 0.2-0.4 mm and indentation line width is 1-1.4 mm. 5. Box pasting must be accurate and cannot be stuck to other paper boxes, or stick to the interior of the box. The paper box must be easy to open and easy to transport. 2. The limit deviation of paper thickness is ±2mm and the diagonal limit deviation is ±1 mm. 3. The fiber direction of the paper should be kept vertical to the direction of the paper folding. 5. The paper is required to cut neatly and with no curls.